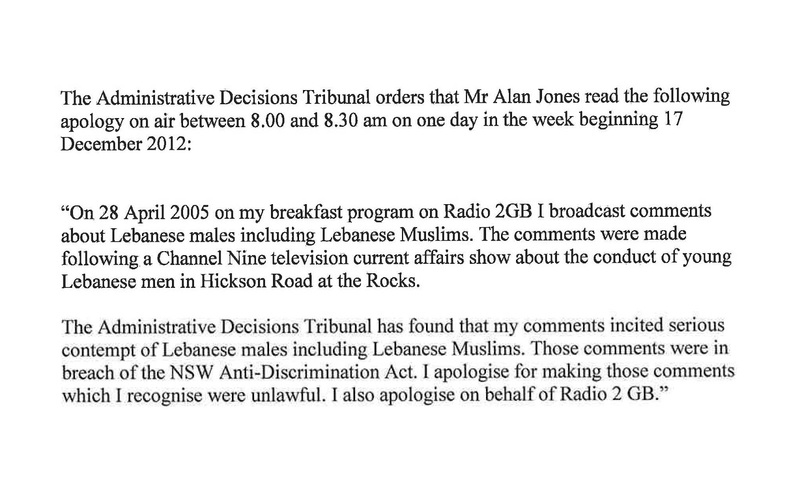 In April 2005, Alan Jones spent almost an entire week berating, denigrating and vilifying the Lebanese Muslim youth. I started a complaint against him with the Anti- discrimination Board of NSW. He took virtually no notice for nearly two years. After that, the complaint was referred to the Administrative Decisions Tribunal. The ADT ruled that Jones must apologise in terms mutually agreeable or the ADT would write the words.. He lodged an appeal. He lost. He then tried to put a unilateral apology on 6 dec 12, the ADT said that was not good enough and ordered the apology you will hear and read below. This apology went to air Today, the 19th of December 2012, 7.5 years after the offensive comments and exactly 7 years after the same radio station defamed me personally. 1 – This long overdue apology is the second final step in a grueling endeavour that has cost me and my family dearly over the past 7.5 years, the final step will be the Tribunal’s determination on costs. 2 – Mr. Jones’ vilification of my community has hampered members of my community in their pursuit of employment opportunities and has hindered our access and equity in what is otherwise an egalitarian society. 3 – During the 7.5 year legal battle, radio station 2gb has not missed an opportunity to gratuitously attack me and defame me, I had taken the station to court over one incident, that matter had been appealed by the station all the way to the High Court and is not yet finished. 4 – Our Anti-Discrimination laws are due for an overhaul, a 7.5 year debilitatingly costly action is not the way to protect minority and maintain a satisfactory standard of public discourse in broadcasting in modern day Australian. Australian society deserves better. I welcome the Federal Attorney General’s present review of the vilification laws in Australia. 5 – This apology is a win for all Australians, as a member of a minority group, I see this win as part and parcel of protecting Australian society from divisive hate speech whilst at the same time protecting legitimate and responsible free speech. 6 – I am very thankful to my legal team led by Mr. Terry Goldberg of Turner Freeman and Barrister Ms. Kylie Nomchong.